Enjoy delicious cuisine and live entertainment with a view of Manila and the surrounding region on this 3-hour dinner cruise along Manila Bay. Choose from three cruise times: sunset, mid-evening or night, then climb aboard a dining yacht for a relaxing evening cruise along the shorelines of Manila Bay. Listen to live music (make some requests, if desired) and enjoy the passing sights, like the world-famous Manila Bay sunset and the frantic lights of popular Roxas Boulevard. Hotel pickup and drop-off included. Start with a Manila hotel pickup in an air-conditioned motor coach. Then travel to the Cultural Center of the Philippines to experience a sightseeing dinner cruise along Manila Bay and the city’s beautiful shoreline. Climb aboard a dining yacht for the 3-hour journey. There are three cruises to choose from. On the sunset cruise, enjoy the world-famous Manila Bay sunset. 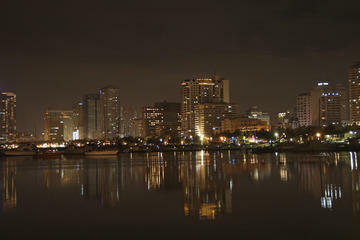 The mid-evening cruise features the hustle and lights of Roxas Boulevard, the popular waterfront promenade which runs along the shores of Manila Bay. Or select the night cruise for a calmer atmosphere as the city settles down to close the day. Enjoy traditional Filipino cuisine — like a fish fillet with buttered vegetables and rice, plus drinks and dessert — while savoring the sounds of a live, local band. Be sure to make requests for favorite songs along the way and enjoy a truly unforgettable evening.